Jalil Anibaba (left) gave the Revolution a 1-0 lead in the first half. FOXBOROUGH — With changes aplenty in the starting lineup, the New England Revolution put forth a reinvigorated effort from the start, earning their first victory of the season, 2-1, over Minnesota United at Gillette Stadium on Saturday. Brandon Bye slotted home his first goal of the season in the 62nd minute to provide the difference after a prolonged attacking spell for the Revs. New England (1-3-1) made changes not just to personnel, but tactically as well, moving to a wider 4-3-3 look and an aggressive high-press system that wore down the well-rested Loons and produced scoring chances in bunches. The Revs struck just 10 minutes into the game when center back Jalil Anibaba made a darting run forward, connecting with a Carles Gil cross on a diving header for the lead. 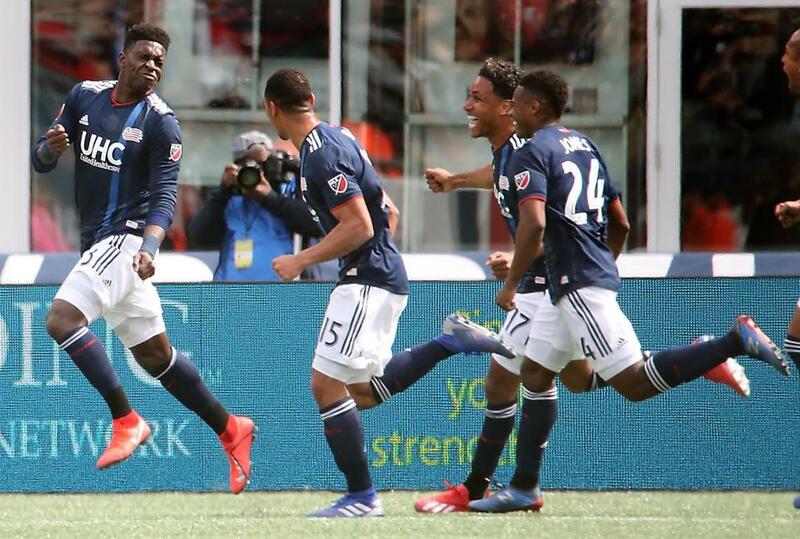 It was the first MLS assist for Gil, who has been involved in four of the Revs’ five goals this year, and the first goal for Anibaba since April 5, 2015. Anibaba was one of six changes to the Revolution starting lineup. Among the others was goalkeeper Cody Cropper, making his first start for New England since September 2017, and he did not disappoint. On three occasions, Cropper aggressively came out of his net to knock away through balls and end quality Minnesota chances. The lead lasted just 16 minutes, however, when Minnesota was awarded a penalty after a video review for handball in the box by New England captain Michael Mancienne. Loons striker Darwin Quintero calmly converted to tie the game. New England limited Quintero to just four shots and no chances created for the game. “It was Mancienne and Anibaba stepping forward in the midfield to stop him from getting on the ball,” said Friedel. With Gil centering the attack, the Revs spread the field against a compact Minnesota backline, stretching six players wide at times, and generated several quality chances either side of halftime. The match sprung to life with three scoring chances in three minutes early in the second half for New England — two by rookie DeJuan Jones that just missed and another by Teal Bunbury that rose over the bar. With play opened up, Jones, making his first career start, found Bunbury. His attempted first-touch shot with his left foot rolled across to an onrushing Bye, who finished at the back post for the lead. Minnesota (2-2) grew more aggressive as the game drew to a close. Quintero narrowly missed a second tally in the 67th minute and substitute Abu Danladi headed an effort high in second-half stoppage time. New England’s fervent attack switched to a more defensive look by game’s end, almost mirroring a 5-4-1 against a top-heavy Loons lineup. Dan can be reached at dan.shulman@globe.com. Follow him on Twitter @DanielRShulman.